User notes: All pictures can be enlarged by clicking. By clicking on the section headers you jump to the corresponding main chapters. The subchapters are not clickable. By clicking the bracketed numbers you will jump to the annotations and back again to the text passage. Anyone who is in any way interested in the Shiba, the Akita or one of the other Japanese dogs has heard that representatives of these breeds are ranked among the "primitive" or "original" dogs. But what is in fact meant by primitive breeds? The FCI classifies all Nordic dogs, the European and Asian Spitzes, some greyhound breeds and the Thai Ridgeback as primitive breeds. They are listed in eight sections within Group 5. Section 5 of this Group 5, entitled "Asian Spitz and related breeds", includes the Chow Chow and the Eurasier as well as the seven Japanese breeds Akita, Hokkaido, Japanese Spitz, Kai, Kishu, Shiba and Shikoku, finally the Korea Jindo Dog. 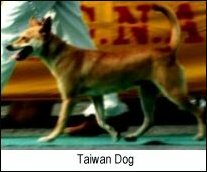 The Taiwan Dog is classified in this Group 5 as "provisionally accepted". Although not recognised by the FCI, the Australian Dingo, the New Guinea Dingo (also known as the New Guinea Singing Dog or NGSD for short) and the Carolina Dog ("American Dingo") are also regarded as primitive dogs. The Australian National Kennel Council (ANKC) included the Dingo in its standard in 1998. In the USA the New Guinea Dingo has been accepted as a distinctive breed since 1996 and the Carolina Dog is recognised as a distinctive breed by five different organisations. The sight of these dogs is charming and intriguing. Are there common features that legitimate grouping them together under a specific nomenclature? The name "primitive dogs" suggests something "time-honoured", "authentic", "uninfluenced", "autochthonous" – in any case positive attributes which one would like to understand more precisely. However if you are looking for some closer explanations or common criteria especially for the primitive Japanese breeds you will be disappointed. There are no criteria at all provided by the FCI and inasmuch as characteristics such as "independent and robust dogs" can be found elsewhere, they remain vague and non-committal. And the plain answer that primitive Japanese dogs are just dogs from Japan is even less satisfactory. So for example the Japanese Spitz was imported from China and Canada in the nineteen-twenties. Characterising dogs as "primitive" makes only sense if seen in relation to the dog's long history of development and to its ancestors. The oldest ancestor of our contemporary dog evidentially is the wolf (Canis lupus). If therefore someone asks for the ancestors and origins of dogs today he will be directed to the wolf (or to the "wolfishness"). In the case of the Japanese dogs – you would think – only the Japanese wolf comes into question. Let's go in search of the origins and take a look at the past! It will be a long journey, during which we will pass an immersed landscape and occasionally go astray. Modern methods of molecular biology with some new insights will pave the way on our travel trough time. At the end hopefully we will have a better idea of what it means that the Shiba belongs to the primitive dog breeds. Since the 18th century there have been debates in academic circles as to who might have been the progenitor, the "primal dog" of our contemporary dogs. All kinds of candidates were declared to be this prime dog, including the wolf, the jackal and the coyote. Even the fox was taken into consideration. Also the place of origin of this legendary dog was zealously searched for, it was assumed to be Eurasia, but also South America. A certain Theophil Studer for years collected "proof" that the prime dog must stem from Switzerland (incidentally Prof. Studer himself was Swiss). This discussion continued until, due to new molecular biology and genetic engineering technologies, the assumptions on the genesis of the dog could be founded on a factual and verifiable basis. Since the nineties mainly two research methods have been applied, which we would like to introduce briefly. These are 1) microsatellite analysis and 2) mitochondrial DNA analysis. The microsatellite analysis is used to examine variations in the inherited material inside the nucleus, i.e. on the chromosomes. With this method distinct sequences on the DNA thread which are repeated and which vary in length in each individual are analysed. These sequences are called microsatellites. They occur in so-called "non-coding regions" of the genome. The microsatellite analysis is mainly a method for recognising genetic variability, i.e. the capability of a whole population to produce individuals with different genetic make-up (genotypes). The mitochondrial DNA analysis (mtDNA for short) is used to examine variations in inherited material outside the nucleus, that is to say in the mitochondria. Mitochondria are so-called organelles ("little bodies") that generate vital energy for the cell (metabolic functions). Mitochondrial DNA is only passed along the maternal line meaning that changes in the mitochondrial DNA of a population are not subject to the classical laws of inheritance. This method also analyses mainly non-coding regions called displacement loops (D-loop for short) or control regions. The mtDNA analysis is the standard method for recognising differences or affinities ("the genetic distance") between different breeds as well as within a breed because distinctions appear only after relatively many generations due to spontaneous mutations. By means of a procedure called "molecular clock" the researched results can be classified finally chronologically. For example this clock indicates how many years have elapsed since two species departed from one common ancestor. Equipped with the new methods of DNA analysis research groups all over the world have started to clear the long history of the development of wolf and dog. Whilst previously researchers were dependent on morphological measurements, taxonomic classifications and various hypotheses, from now on dependencies and divergences could be proved more directly. Thus some commonly accepted assumptions could be revised or stated more precisely. Another group of researchers working with Peter Savolainen of the Royal Institute of Technology (KTH) in Stockholm focussed on the beginning of dog's domestication in an inquiry representative of all contemporary breeds. According to their results all domestic dogs have a common East Asian origin, going back approximately 15,000 years. On the basis of their analyses Savolainen and his colleagues finally assumed a single gene pool for all dog populations worldwide. Diverse groups of researchers in Korea and Japan then highlighted the origin of the domestic dog in East Asia and examined Japanese dogs in particular. First of all a Japanese group working with Yuichi Tanabe laid the foundation with a widespread study on the ancestry of Japanese dogs. According to Prof. Tanabe's results contemporary Japanese breeds descend from dogs that came to Japan in two waves at the end of the ice age (Pleistocene or Glacial epoch). They are partly descendants of dogs that first came from Southeast Asia to Japan approx. 10,000 years ago and partly stem from dogs that immigrated in a second, smaller wave along with the Yayoi people via the Korean peninsula 1,700 to 2,300 years ago. The study by Prof. Tanabe and his colleagues has repeatedly been the starting point for further analyses examining Japanese dogs more closely. Thus a group working with Naohiko Okumura  provided evidence that Japanese dogs have developed by interbreeding with dogs from the same breed (intrabreed) as well as by crossbreeding with dogs from other breeds (interbreed). This interbreeding was so intensive that in the analysis the individual Japanese dogs could not be clearly distinguished genetically. From the fact that all our contemporary dogs are genetically derived from the wolf naturally it does not follow that all of them – from the tiny Chihuahua to the huge Tosa Inu – have an equal wolfish genetic constitution. Due to domestication and mainly due to breeding measures man has deeply interfered with the genetic household of the different breeds. Some characteristics (internal as well as external) have been intensified or made to disappear. In some cases even hereditary diseases such as hairlessness have been ennobled as a breed trait, e.g. as with the naked dogs. The great Austrian wolf researcher Eberhard Trumler has pointed out that our modern dogs have been allowed to inherit the "good" traits of the wolf, especially its social capabilities, its "sense of family". Due to these abilities originating from the wolf the dog was exceptionally adapted for living together with man and therefore "our dogs exactly in this respect were permitted to stay wolves". The price for this elaborated adaptability and social compatibility is the loss of the untamed, the wild, in short the "wolfishness" as we like to call it. This measure of loss varies in the single breeds. In newer breeds where man has more rigidly interfered with the inherited material it is obviously higher than in older, more "primitive" breeds such as Spitz-type dogs like the Japanese dogs. In the year 2004 a large-scale microsatellite study by a group of researchers from the University of Washington on the genetic structure of the domestic dog yielded a result that surprised even the experts. In this study 424 dogs from 85 breeds representing all dog breeds worldwide were analysed with respect to their genetic closeness to the grey wolf and finally grouped in five different clusters. In doing so a group of breeds appeared showing a high genetic relationship to the wolf. The Shiba Inu also belongs to this cluster and with regard to its genetic closeness to the wolf, ranks second after the Chinese Shar-Pei! The following figure from this study shows all 9 breeds from this "wolf cluster" in form of a tree revealing their individual closeness to the wolf. All other breeds outside this cluster have merely an unspecific genetic relationship to the wolf. More or less all contemporary dogs bear genetic material from their wolfish ancestors. In case of the Korean dogs (Jindo, Sapsaree, Chejudo) that are closely related to the Japanese breeds the researchers assume the influence of at least two East Asian wolf populations. Therefore it's quite normal to ask if the Japanese wolf has not passed on its wolfish part to the Japanese dogs. Our inquiry into the primitive Japanese breeds includes the Japanese wolf. What do we know about him? – The Japanese wolf (Canis lupus hodophylax, also spelled hodophilax) who lived on the islands known today as Honshu, Shikoku and Kyushu. In Japan the Japanese wolf (Nihon-okami) is also called Honshu wolf. – The Hokkaido wolf (Canis lupus hattai) who lived on the islands known today as Hokkaido, Sakhalin, the Kamchatka Peninsula and the southern Kuril Islands. He is also called Ezo wolf (Ezo-okami). The Hokkaido wolf was a little bit bigger than the Honshu wolf. – The Korean wolf (Canis lupus coreanus) on the Korean Peninsula which is still extant. All three wolf species were derived from the Siberian grey wolf which was widespread from Eurasia over the Arctic regions to North America. Controversial however is the point in time when the separation from the grey wolf took place. The wolf is especially in the rural regions and in the Japanese mountains omnipresent. The Japanese word for wolf (okami) can be found in many place-names, e.g. Okamitaira (Wolf Plateau), Okamizawa (Wolf Marsh) or Okami'iwa (Wolf Rock). The wolf is revered annually in ceremonies and is part of many Shinto shrines, for instance the Mitsumine Jinja shrine which is of particular importance for the Japanese people. Furthermore the wolf can be found in numerous works of art, pictures, statues and talismans. As opposed to the "bad wolf" of the European myths and fairy-tales, the wolf in Japan was considered as a "benign beast" (ekiju). In the wolf legends (okuri-okami) he appears as protector and helper of the poor and vulnerable or he warns the people of menacing natural disasters. In particular he was said to be the "guardian of the way" (this is also the literal meaning of his zoological (Greek) name "hodophylax") who protects wanderers in the mountain forests. One noted story is about a blind flute player who had lost the way in the mountains and was guided down by what he believed was a hunter. Not until he approached the village did he discover that the hunter was a wolf. For the Japanese the wolf was not simply an animal but a creature with transcendental capabilities, a mountain spirit (yama no kami) being well-disposed towards people. If in return people did not respect him he could also be bad. According to John Knight, one of the best experts on the Japanese wolf, the attitude of the Japanese people to the wolf reflects their overall attitude to nature. And as nature sometimes appears menacing to man likewise the wolf at certain times was felt as a menace and accordingly hunted. Only today when nobody is threatened by the wolf any more is he perceived as a lost part of nature. Is the Japanese wolf really a wolf? The Japanese wolf was grey-haired and remarkably small, from head to tail he measured about 34 inch, whilst the Siberian grey wolf can have a body length of 55 inch. His tail was about 12 inch long. This difference in size to the European wolf had already attracted the attention of Philipp Franz von Siebold whose description is the only one by a non-Japanese witness. Siebold served as a Medical Officer in the Dutch East Indian Army and stayed from 1823 until 1829 in Nagasaki Bay. In his "Fauna Japonica" (published 1842 in French in Leyden, Holland) he describes the wolf from the mountains and forests that the Japanese called Jamainu, i.e. "mountain dog" (the other Japanese name "Shamainu" is just a corruption of Jamainu). Siebold examines carefully the size of the different parts of the wolf's body and concludes that because of his small size the Japanese wolf cannot be related to the European wolf. He considers him instead to be a remote relative of the North American wolf. The following illustration of the Japanese wolf is taken from his description in the "Fauna Japonica". Due to its remarkable slight build a controversy concerning the origin of the Japanese wolf has arisen recently in Japan. In this dispute there are two contrary positions. One position insists that the Japanese wolf is a subspecies of the grey wolf and explains its small size by ecological changes in pre-historic Japan resulting in the extinction of large prey species. The Japanese wolf had to adapt to this evolution and quasi shrank accordingly. The other position in contrast maintains that the immigrated Siberian wolf already had mixed with the ancestors of the Japanese dogs – an assumption that is in accordance with newer insights of DNA research. The literal meaning of Jamainu thus complies with the real facts; the wolf is really just a "mountain dog". If that is the case, then the Jamainu described by Siebold was not really a wolf. If the Jamainu or Japanese wolf was not really a wolf, then he could only have been a dog, a Canis familiaris japonicus or Nippon'inu as it is named in Japanese. Siebold was also first to describe the Japanese dog, in even more detail than the wolf. It is worthwhile to take a look at his description of the Japanese dog in his "Fauna Japonica". hound dog: Kari-inu, also called No-inu. street dog: Bawa-inu, also called Kai-inu, and Muku-inu. According to Siebold the street dogs were imported from China, India and also Europe to Japan and have mixed with the indigenous hound dog. Siebold gives no specification of size, neither for the hound dog nor for the street dog. domestic dog: Makura tsin (a pet dog), Suiken tsin and Sjok-ken (a dog for eating). The Tsin (Chin) was imported, according to Siebold, from China (Macao), brought there by the Portuguese. Siebold also mentions the Ookame, which lived in hiding and which was considered to be a cross between the hound dog and the Jamainu or wolf. He was said to be a clever hunter on land and as well as in the water. Unfortunately the difference between the Ookame and the Jamainu is not explained farther, Siebold just says that the Japanese appreciated the flesh of the Ookame as a meal, whereas the consumption of the Jamainu was believed to be harmful to health. Whilst Siebold restricts his description of the Japanese wolf to its appearance, in his examination of Japanese dogs he also goes into their way of living and history. He considers the hound dog to be a descendant of Siberian dogs which accompanied hunters and fishermen on their hunting expeditions across the country. The street dogs in contrast are described as hybrid hound dogs that live in towns and waterside villages, partly wild but a constant companion to man. Finally domestic dogs are considered to be hardly worthy of description. Overall Siebold does not draw a particularly complimentary picture of the Japanese dog. He sees the street dog and the domestic dog as bastards and petted and the hound dog on the road to degeneration. In search of a progenitor of the contemporary Shiba the Canis familiaris japonicus also came into question. 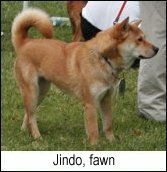 In her commendable book "The Complete Shiba Inu" Maureen Atkinson refers to (unnamed) Japanese researchers who allegedly consider the "pure-bred" Canis familiaris japonicus to be the direct ancestor of the present-day Shibas. According to the description of Siebold, Temminck and Schlegel, who are acknowledged zoologists, the Canis familiaris japonicus was neither a specific breed nor especially "pure-bred". As a noble ancestor he is hardly suitable. Interesting indeed in Siebold's description is not so much the somewhat derogatory tone in which he characterises the Japanese dog but more the picture that he draws of their way of life. He pays particular attention to street dogs, the Bawa-inu and the Muku-inu. According to Siebold they live mainly in towns with closed quarters where they form a big family together with the residents. The street dogs do not have a distinct owner but belong to all people in the neighbourhood. One of their duties is to protect the quarter at night. One of the reasons why they are welcome by the people is that they eliminate litter and thus ensure cleanliness. These dogs are just partly domesticated and live very independently. They can also become a plague if they go marauding about the streets at night attacking livestock such as chickens, pigs and goats. This picture of the Japanese dogs corresponds in detail to the description by Alfred Brehm in his "Animal Lives" of the street dogs in Cairo and Constantinople. The famous natural scientist watched these dogs around 1847 on his travels to Egypt and the Middle East, just 20 years after Siebold's sojourn in Japan. While Siebold characterises the street dogs as "paupers" and "mendicants" (pauvres, mendiants) Brehm calls them by the catchy title pariah dogs. According to Brehm the term pariah dog goes back to the British colonial masters who had transferred it from the pariahs, the lowest social layer in Indian society, to the ownerless dogs in the cities. These dogs lived like outcasts on the brink of the community but always in contact to and dependent on humans. In our days such dogs still can be found in the South and East of Europe as well as in large numbers in Southeast Asia (Bali Street Dog). Today pariah dogs include the breeds mentioned at the beginning, namely Dingo, Carolina Dog and Korea Jindo as well as the Basenji and Canaan Dog characterised by the FCI as "primitive breeds" and some other breeds in section 6. The term is no longer disrespectful; on the contrary it refers to extraordinary breeds with a long history of development. Today feral dogs like the Australian Dingo or the New Guinea Singing Dog are also considered to be pariah dogs. Common to many pariah or feral dogs is that despite differences in their outside appearance, they have some traits of the wolf, e.g. they do not really bark (although they are able to do so) but communicate by howling. Perhaps the answer to the controversy which arose in Japan as to whether the Jamainu was still a wolf or already a dog is that he was neither a domestic dog nor a wolf but a feral dog, a pariah dog. Maybe Siebold unconsciously chose the correct word in his description of the "loup du Japon", the Japanese wolf, by calling him at the same time a "chien sauvage", a feral dog. Obviously the mountain dog Ookame mentioned by Siebold, which the Japanese themselves characterised as a species between wolf and dog, was also such a feral dog. The majority of Japanese scientists tend to be of the opinion that the Japanese wolf actually was a genuine wolf and not a dog. However after reviewing the sources it appears to us that the latter is more plausible. Reliable information however can only be expected by a DNA analysis. In Japan the investigation of the wolf using up-to-date methods just has begun. A study has already been published which compares the skull of the Akita Inu with that of the Japanese wolf using computer tomography. And in 2002 a group of Tokyo University and other researchers have extracted a gene from a stuffed Japanese wolf and conducted the first ever gene analysis on the extracted cell nucleus. We can look forward to the solution of the mystery of the identity of the Japanese wolf. Nevertheless the wolf in Japan also was increasingly hunted and finally systematically eradicated. There were multiple reasons for this connected to the opening of Japan to the West and the loss of traditions. First, wolves appeared as vectors of rabies and distemper which they had contracted from imported European dogs. Later, wolves occasionally endangered the newly arisen horse breeding on pastures so that the breeders on Hokkaido Island on American advice used traps (see picture) and strychnine-poisoned baits. Supported by the emperor's court finally rewards for killed wolves were offered whereupon professional wolf hunters established. Even the Ainu, the aborigines of Hokkaido who believed themselves to be born from wolves, took part in the campaign against the wolf. In 1889 the Hokkaido wolf was eradicated by the farmers and breeders on the Northern island, in 1905 the last Honshu wolves died due to a rabies epidemic. The only remains of the Japanese wolf are some skulls and five stuffed exemplars in Japan, Holland and in the British Museum in London. Since the extinction of the Japanese wolf, time and again voices of visionaries were raised claiming to have seen a surviving wolf in remote mountain regions. Also recently several projects have been announced for plans to resettle the Japanese wolf by means of imported populations. All this can be viewed as a sort of national remorse for the extinct wolf. Since there are no longer ecological preconditions in densely populated Japan for wolves to run wild, all plans for making the wolf native again are doomed to failure. In the history of canine science sometimes strokes of luck happen by which an actually extinct breed is restored to life. Such a stroke of luck occurred in 1930 when the canine researcher Rudolphina Menzel who had emigrated from Vienna re-bred the Canaan Dog from pariah dogs in Palestine. Meanwhile the Canaan Dog is one of the FCI recognised primitive dogs (section 6). Recently in Japans something similar also occurred – almost without any notice from the outside world. The archetype for the Jomon Shiba was the Jomon dog which came to Japan approx. 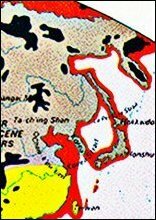 8,000 years ago from Southern China via Taiwan and the Ryukyu Islands. The Jomon dog is next to the Yayoi dog, which emigrated from Korea approx. 1,700 years ago, the progenitor of contemporary Japanese dogs. He was similar in build to today's Shiba whereas the Yayoi dog was somewhat bigger. Whereas in Europe and America simply the Shiba in general is known, the Japanese distinguish precisely between four local Shiba-varieties, named after the regions they come from: the Shinshu Shiba (today spread all over Japan); the Mino Shiba, the San'in Shiba and the Akita Shiba from the homonymous prefecture from which the Akita Inu originates. The Akita Shiba is a cross-bred between Shinshu Shiba and other local Shiba populations. Starting with this Akita Shiba Japanese fanciers have re-bred the Jomon Shiba. In doing so they used reproductions of the Jomon dog from excavation finds as orientation. To get an impression of how well the breeding succeeded, the following photo shows a Jomon Shiba together with a reproduction of the historical Jomon dog. It is remarkable that the SHIBAHO breeders do not simply want to make the historical Jomon dog present again. Moreover, their target is to tie in with the Japanese wolf with respect to both its external build and its nature. According to the sparse reports that are available the Jomon Shiba is much more spirited, "wilder" than the Shiba Inu we know. And regarding the external similarity to the Japanese wolf you can judge this by the following picture in which we have placed a Jomon Shiba alongside Siebold's picture of the Japanese wolf for comparison. Special attention is paid by the SHIBAHO breeders to the stop of the Jomon Shiba. A subject of discussion in the controversy about the identity of the Japanese wolf is the stop which is rather flat for a wolf species. On the picture on the left you can see the skull of a Japanese wolf with the flat stop (arrow), above is the skull of a North American wolf. Regardless of the question as to whether the Japanese wolf actually is a wolf or after all a feral dog, the SHIBAHO breeders have bred exactly this flat stop. By doing so they have consciously distanced themselves from the somewhat higher stop of the "normal" Shiba, which in their eyes accommodates Western taste – a cuteness. 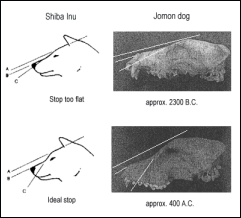 The term Jomon dog comprehends two different populations, a dog from the earlier Jomon culture with a flat stop and another dog from the later Yayoi culture with a higher stop. This discrepancy can be observed well on account of cranial finds from the two different periods. The picture on the left illustrates the comparison between two such different skulls from Jomon dogs and the cranial shape of the contemporary Shiba. If the perspective is not completely deceptive the correct contouring of the Shiba approaches the cranial contouring of the Jomon dog from the late period. In contrast the cranial contouring of a Jomon dog from the earlier period resembles more a Shiba's skull which according to the standard would be too flat. The breeder's idea is that the flatter stop in the style of the older Jomon dog and the Japanese wolf is supposed to lend the Jomon Shiba a more wolf-like expression. The Jomon Shiba combines characteristics of the historical Jomon dog, of the Japanese wolf and of the contemporary Shiba Inu – maybe further evidence for the assumption that at an early stage the Japanese wolf mixed with primitive Japanese dogs. Our little journey through time to the origins of wolf and dog is over. Due to new results of DNA research we know now that the Japanese breeds do not have a single common origin, but are derived from multiple Asian ancestors (wolves as well as canids) who came to Japan on different routes (Far East, China, Korea). There is no Japanese "primal dog", the Japanese wolf played a role in the genesis of the Japanese dogs possibly in the early stages. And also the Canis familiaris japonicus is at most a newer relative of the six Japanese breeds. group "A" with the Hokkaido and the Ryukyu dog. group "B" with the San'in Shiba and the Japanese Tsushima, Korean breeds and dogs from Sakhalin. and group "C" with the Akita, Kai, Kishu, Mikawa, Shikoku, Satsuma and the Shinshu Shiba as well as the Mino Shiba. The dogs in group "A" that are the offspring of the early Jomon dogs have remained genetically constant. The dogs in group "B" are offspring of the later Jomon or Yayoi dogs which mixed with the early Jomon dogs since the 8th century A.D. Due to hybridisation the dogs in group "C" finally have changed most strongly from the Jomon dogs. As one can see, in his three varieties the Shiba shares two different genetic groups. It could be said he is not only a primitive but a "double-primitive" dog. Crucial, however, is that the Shiba together with the other Japanese dogs and with the closely related Korean breeds has a genetically well traceable basis. In this respect the term "primitive" characterises the Shiba well. We hope to have outlined some cloudy terms and vague ideas more clearly. But we also came across new questions which have not been answered satisfactorily yet. For example, we would like to have the question of the identity of the Japanese wolf cleared up. Or what is the mysterious Ookame, the feral dog from the Japanese mountains all about? We would like to have more information on the Kai-Inu, that Japanese hound dog mentioned by Siebold. And also the current situation is contradictory: is the Akita Shiba a genuine variant alongside the three recognised Shiba populations and why did the breeders of the Jomon Shiba choose exactly this Shiba from the Akita prefecture as a starting point? Dogs are an inherent part of the human's cultural development. Because of that every discussion about the history of dog sheds light on us; it is helpful for a better understanding of our own past and present. The scientific research of the dog by means of DNA analysis has also led increasingly to a better understanding of genetically caused human diseases. In the Japanese research the Shiba takes a special position. One example is a project at Hokkaido University in which research is being carried out on a severe hereditary disease by the name of GM1 gangliosidosis on the basis of Shiba dogs. Humans as well as animals can contract this disease which affects the central nervous system (brain) and quickly ends up mortally. By means of DNA analysis and other methods of modern molecular biology we can expect more answers to some open questions in the future with our dogs playing their part. Vila C., Maldonado J. E., Wayne R. K.: Phylogenetic relationships, evolution, and genetic diversity of the domestic dog, Journal of Heredity 90 (1999), pp. 71-77. Vila C., Savolainen P., Maldonado J. E., Amorim I. R., Rice J. E., Honeycutt R. L., Crandall K. A., Lundeberg J., Wayne R. K.: Multiple and ancient origins of the domestic dog, Science 276 (1997), pp. 1687-1689. Savolainen P., Zhang Y. P., Luo J., Lundeberg J., Leitner T.: Genetic evidence for an East Asian origin of domestic dogs, Science 298 (2002), pp. 1610-1613. Even though Tanabe's study is not based on an mtDNA analysis of the solely maternal inherited genes leading to a certain element of uncertainty, his results are nevertheless widely accepted. Okumura N., Ishiguro N., Nakano M., Matsui A., Sahara M.: Intra- and interbreed genetic variations of mitochondrial DNA major non coding regions in Japanese native dog breeds (Canis Familiaris), Animal Genetics 27 (1996), pp. 397-405. Kim K. S., Tanabe Y., Park C. K., Ha J. H.: Genetic Variability in East Asian Dogs Using Microsatellite Loci Analysis, Journal of Heredity 92 (2001), pp. 398-403. The Shiba showed the least genetic variability. This is not necessarily a glorious chapter (especially "purebred") but indicates rather a relative gene deficiency due to inbreeding. Tsuda K., Kikkawa Y., Yonekawa H., Tanabe Y.: Extensive interbreeding occurred among multiple matriarchal ancestors during the domestication of dogs: Evidence from inter- and intraspecies polymorphisms in the D-loop region of mitochondrial DNA between dogs and wolves, Genes & Genetic System 72 (1997), pp. 229-238. Eberhard Trumler: Das Jahr des Hundes. Ein Jahr im Leben einer Hundefamilie, München 1986, p. 7. Heidi G. Parker, Lisa V. Kim, Nathan B. Sutter, Scott Carlson, Travis D. Lorentzen, Tiffany B. Malek, Gary S. Johnson, Hawkins B. DeFrance, Elaine A. Ostrander, Leonid Kruglyak: Genetic Structure of the Purebred Domestic Dog, Science 304 (2004), pp. 1160-1164. Leonard J. A., Wayne R. K., Wheeler J., Valadez R., Guillen S., Vila C.: Ancient DNA evidence for Old World origin of New World dogs, Science 298 (2002), pp. 1613-1616. Knight had carried out intensive research on the wolf in Japan and cites from Japanese sources. It must always be taken into consideration that Siebold is only describing the wolf from the Honshu main island and not the Hokkaido wolf. Walker too had done research on the wolf in Japan and likewise is citing from Japanese original documents. Tsuda et al., Extensive interbreeding [Note 8]. Maureen Atkinson: The Complete Shiba Inu, Ringbress Books 1998, p. 8. A fine example of a pariah dog in the canine scientific sense is the story of the semi-wolf White Fang and his mother Kiche in Jack London's famous novel with the same title ("White Fang", 1906). Endo H., Obara I., Yoshida T., Kurohmaru M., Hayashi Y., Suzuki N.: Osteometrical and CT examination of the Japanese wolf skull, The Journal of Veterinary Medical Science 59 (1997), pp. 531-538. Chikashi Tachi, Tomoya Enomoto, Yu Matsubara, Ai Ueda, Teppei Hasegawa, Junichi Matsuyama, Masato Tsuchiya, Mitsuaki Ohta, Yuichi Tanabe, Tatsuo Suzuki , Hideki Endo, Tadasu K. Yamada, Masamichi Kurohmaru, Yoshihiro Hayashi, Yumi Asano, Keitaro Yamanouchi, Hideaki Tojo: Successful Molecular Cloning and Nucleotide Sequence Determination of Partial Amelogenin (AMELX) Exon DNA Fragment Recovered from a Mounted Taxidermic Pelt Specimen Tentatively Identified as an Extinct Wolf Species, Canis lupus hodophilax Temminck, the Japanese Wolf and Stocked at School of Agriculture and Life Sciences, the University of Tokyo, Journal of Reproduction and Development, Vol. 48 (2002), pp. 633-638. The result of this study is that "further molecular analysis of the intraspecific as well as the interspecific variations in the AMELX DNA will be needed to gain clear insight into the taxonomical and phylogenetic positions of the Japanese wolf". The end of the hounding is described by Tolstoy with these words: "The huntsmen assembled with their booty and their stories, and all came to look at the wolf, which, with her broad-browed head hanging down and the bitten stick between her jaws, gazed with great glassy eyes at this crowd of dogs and men surrounding her. When she was touched, she jerked her bound legs and looked wildly yet simply at everybody." (War and Peace, Book Seven, Chapter V). Nowadays we have to distinguish between 1) the well-known "Preservation Society for Japanese Dogs", in Japanese "Nippon Inu Hozonkai" or "Nihoken Hozonkai" (NIPPO for short), from 1928 which is dedicated to the conservation of the Shiba and the other Japanese dogs and 2) the new "Preservation Society for the Shiba Dog", in Japanese "Shiba Inu Hozonkai" (SHIBAHO for short), from 1959 which is dedicated solely to the Jomon Shiba. The information from Japan is unclear: In his study from 1991 [Note 4] Prof. Tanabe talks of four local Shiba varieties, amongst them the "Akita Shiba". In later publications he talks of the "Jomon Shiba" exclusively. Other Japanese authors in contrast stick to the three known Shiba variants San'in, Mino and Shinshu. See Michiko Chiba, Yuichi Tanabe, Takashi Tojo, Tsutomu Muraoka: Japanese Dogs. Akita, Shiba, and Other Breeds, Kodansha International, Tokyo, New York, London 2003, p. 72. Yuichi Tanabe: Genetic Evidence for the Routes Dogs Took to Japan, Japanese Dogs [Note 23], pp. 66-69. Possibly the name Ookame is just a regional variant of okami, the Japanese word for wolf; on the varying spellings for wolf in Japanese cf. John Knight: Waiting for Wolves in Japan [Note 12], p. 195. Yamato O., Masuoka Y., Yonemura M., Hatakeyama A., Satoh H., Kobayashi A., Nakayama M., Asano T., Shoda T., Yamasaki M., Ochiai K., Umemura T., Maede Y.: Clinical and clinico-pathologic characteristics of Shiba dogs with a deficiency of lysosomal acid β-galactosidase: a canine model of human GM1 gangliosidosis, The Journal of Veterinary Medical Science 65 (2003), pp. 213-217. In addition a series of further articles by this research group on the same subject.